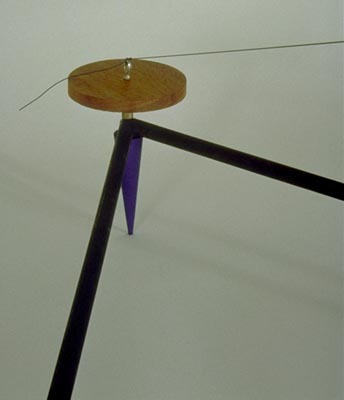 Contemporary kinetic sculpture by Keith Farley . . . "Survival #9"
In the center of each of these are sterling silver eye screws that provide points at which the cords may be terminated, thus allowing the plumb bobs to be suspended. 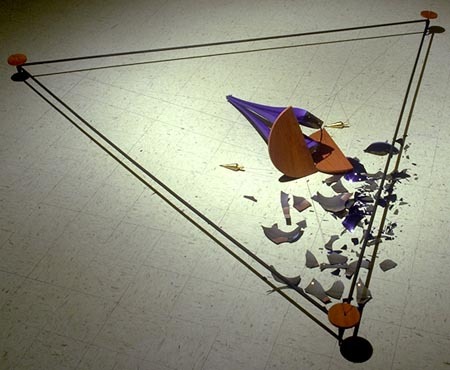 Besides the small point on which the table rests, the plumb bobs provide the only other support. Finally, on top of the table is placed a blue, reflective, glass sphere that faces the inherent danger of life--de-stabilization.